The Varichair uses active sitting principles which promote good posture. Without using a backrest, it promotes proper posture through the activation of core posture muscles based on its unique sitting position. If there’s a secondary chair to be considered for better posture, Varichair can be it as it promotes an active lifestyle. Based on principles of sitting and standing, the Varichair is already proven as it has its legions of fans and reviews. But can be a standalone option or is it a good secondary chair to add some variation at the office? There are many benefits offered by Varichair. Unlike traditional chairs, it raises many questions and it intrigues new users. The good news is that this curiosity is actually met by functionality which allows it to be considered as a top product, even for those who have never tried similar designs. Varichair’s design seems to confuse a lot of people. In a way, it comes with a seat pan with a small handle on the back, which can make it similar to some bar stools. But the Varidesk is actually versatile and suitable for many other purposes. Since Varidesk makes office products, the Varichair would be suitable in an office environment. But its height doesn’t allow it to fit under a classic desk. Instead, it works great with height-adjustable desks, even those from Varidesk. The Varichair is ready to handle vertical adjustability. This is one of its main strengths according to Varichair reviews. It comes with height-adjustability set in the range between 23” and 32”. Now, this is not the highest a stool-based design can beat as there are a few options at 37”. However, it works for people of various heights which is what matters in the end. Its weight capacity is not the highest either. With a maximum capacity of 220lbs or the equivalent of 100kg, the Varichair can still handle most people. This weight capacity is actually given by its air-lifting cylinder which can be damaged by heavier users above this maximum capacity. But the air-lift piston is easy to use. It has a side lever which is pressed to adjust the height as needed. In a way, this mechanism is already very similar to what is seen on the market on most adjustable chairs, so it should be intuitive to use. The base of the Varichair is compact. Unlike chairs which have a larger base as the seat pan, the Varichair has a compact base which will reduce the required space in cluttered offices. If used in meeting rooms, it can even save more space with multiple stools placed next to each other. But the Varichair can also be considered outside the office. A musician can use it as well as any other type of stand up artists or presenters. The Varichair allows users to set it a more vertical position, which is suitable when facing crowds. At the same time, it can be used at the bar at home or even in the garage or the basement where it can offer versatility for multiple activities. Unlike other bar stools or most other similar designs, the Varichair also comes with a tilting design. It means users rarely sit on it as on fixed bar chair. They actually sit in a position where the Varichair leans forward. Even in this position, it is still stable and it offers plenty of grips when the feet are touching the ground. There are a few instances where the Varichair might pose some problems. One of the issues new users have with the Varichair simply comes with the way they perceive the sitting position. The learning curve might be longer compared to what fixed stools offer. However, it should not take more than a few days to make the most of the Varichair’s design versatility. Even more, there is space for practically any type of movement. From leaning forward to making left or right turns to reach files or documents, the Varichair can support all types of movements. One thing which needs to be taken into consideration is the reduced comfort the Varichair has to offer. It is not exactly the solution made for 8 hours of sitting and it is why it can get a bit tiresome after a while. Users expect it to act similarly to a normal office chair, which is not the actual case. In most situations, the Varichair is actually used as an alternative and a second sitting solution to boost an active style of sitting. Judging by this premise, the Varichair can be a simple solution to use up to a few hours per day to improve posture. It even helps burn more calories. Dynamic sitting is actually just starting to be researched at its full potential. What is known so far is that this type of sitting can’t actually be the base of an entire shift at work, but it can be used successfully with fixed or non-adjustable alternatives. Having a short warranty and a small seat can also be problems for a number of users. With a limited 1-year warranty, the Varichair might need some attention, especially in commercial environments where it can be used for longer periods of time. Furthermore, the small seating areas is another problem for those looking at comfort similar to what traditional office chair has to offer. 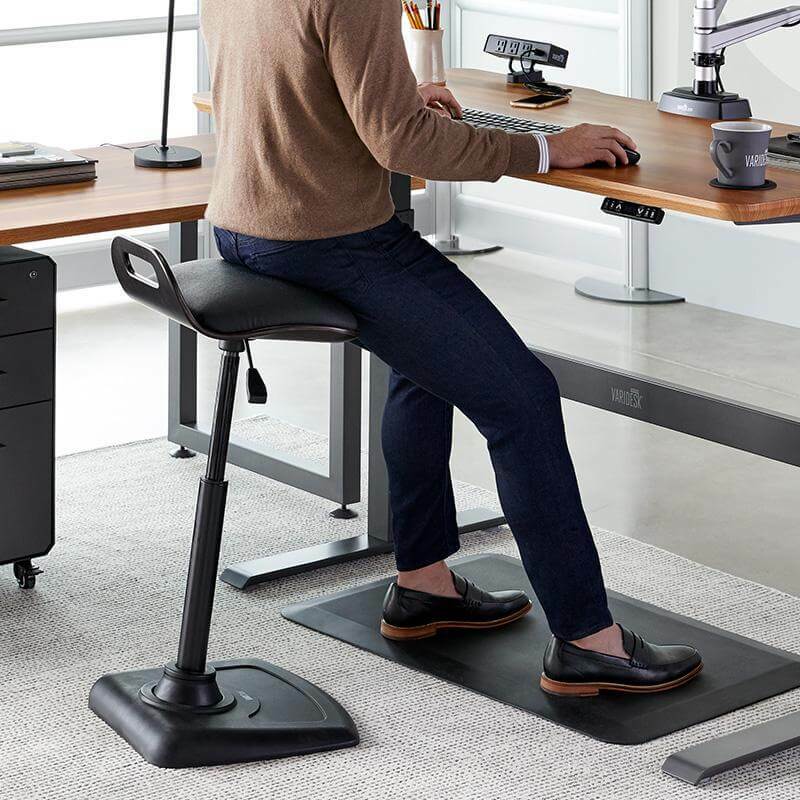 The small seat might make office workers feel like they are on the go and actually less concentrated on demanding tasks. However, this can also be an advantage as it maintains alertness. Certainly, the smaller seat pan can also work great for stand-up meetings which are so popular in corporations these days. The Varichair might be one of the durable dynamic range sitting solutions at the office. It suits standing desks the best and it works with the manufacturer’s desks well as a result. Sitting on the Varidesk requires activating leg muscles, core muscles, and back muscles. All these muscles work together to maintain proper posture. 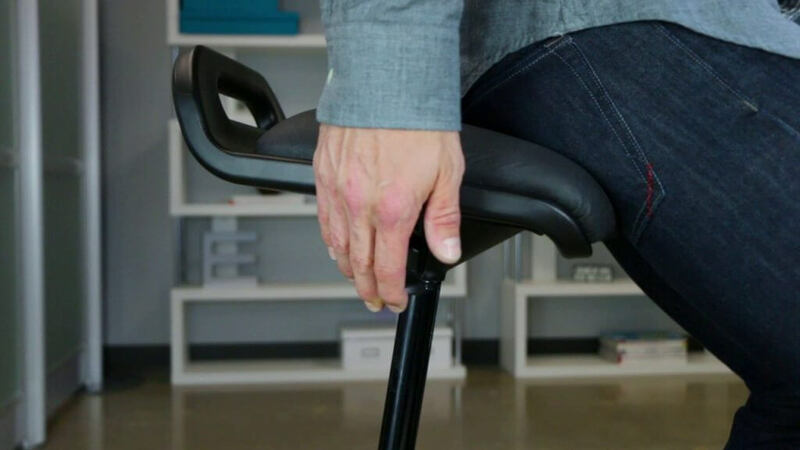 For most users, it means they finally have the capacity to sit properly without letting the desk workstyle affect their posture, and ultimately, their health. In figures, the Varichair comes with a weight of under 30lbs. It is weighted base has a size of 40.1X 40.1 cm. Its height adjustments work from a minimum of 58cm to a maximum of 83cm. Its maximum user weight is 100kg. These figures might not mean too much on paper. But they still place Varichair among the designs which are up to date for proper posture improvement. One question put by new users refers to the cushioning of the Varichair. While it is cushioned, this comfort is very different from what is expected when compared to classic desk chairs. It is why the Varichair is comfortable up to a few hours. The foam cushioning offers enough support but the pressure felt after a few hours can include the legs and the back. It is why users are actually advised to sit on the Varichair alternatively, at least in the transition phase together with their old desk chair. This allows the spine to relax from time to time. It also allows the feet to get off the ground in some cases, which can reduce pressure on the feet. There are no reasons not to try the Varichair immediately. Since it comes pre-assembled, it needs no special attention out of the box. The Varichair is actually supportive from the first try but users need to learn that its wobble is actually controlled by them. There is a learning curve to go through. The good news is that once mastered, the Varichair can even seem more comfortable than many of its larger alternatives. One of the distinct features of the Varichair is with its leaning design. It is here that it impresses with its stability and flexibility with any type of motion. It is why the Varichair can be considered in situations where workers would have to face customers. So working in customer service can actually benefit from this angle versatility. Easily getting on and off the Varichair means workers can also feel more mobile, more engaged, with extra energy and an improved mood which are crucial for customer service success. At the same time, those working at a computer on a standing desk can consider the chair for the moments when the standing desk is fully extended or nearly at its highest point. So if a regular chair is used on a lower desk position, the Varidesk immediately changes this and adapts into a versatile solution to add to the dynamics standing desks come with. Besides showing immediate results in terms of energy, properly managing these switches will take time, however. Making the jump and choosing Varichair at the job might not be easy for some users. However, its drawbacks are simply outnumbered by its benefits. 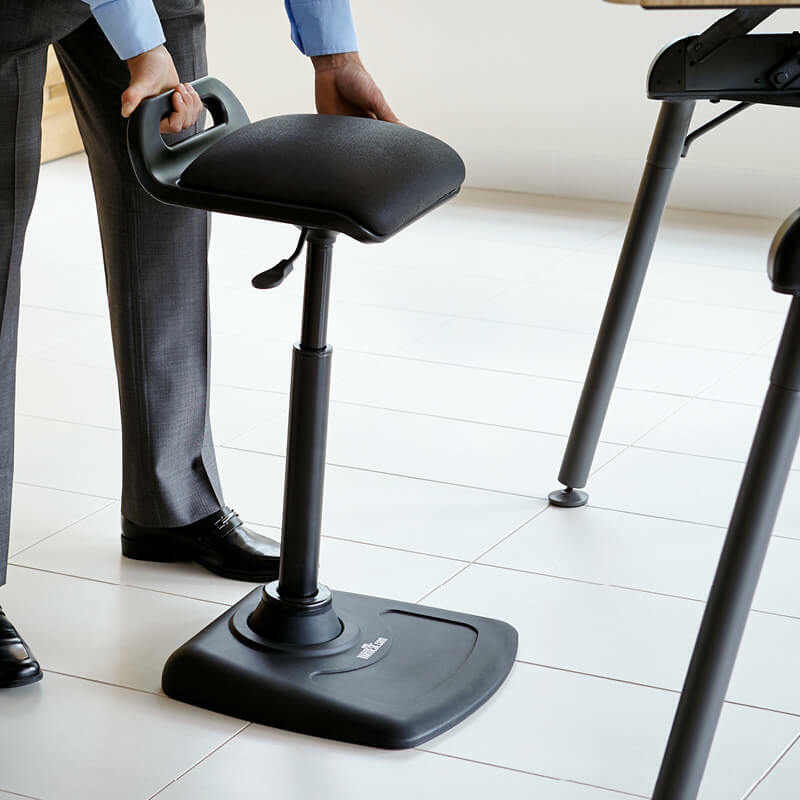 With such freedom of movement, the Varichair can allow users of different heights to add that extra energy which comes with dynamic sitting to their work life. Another result seen in time comes with better posture. In the real world, the Varichair actually forces users to sit in the correct position. At $195, the Varichair is not the most affordable design in its class. But its distinct features include a solid base and fully assembled shipping. Busy workers can consider it immediately as an alternative to an office chair. But they would only do so in the right office, where they would have a height-adjustable desk. For these reasons, the Varichair is an inspired choice, but only under certain conditions. In the end, the Varichair is not just another bar chair. Even if its design doesn’t do it any justice, it actually comes with its own identity. Making users feel as if they are learning how to sit once again, the Varichair has a modern approach to workplace dynamics. It just requires users to go through a learning curve to master its full potential for posture improvement. 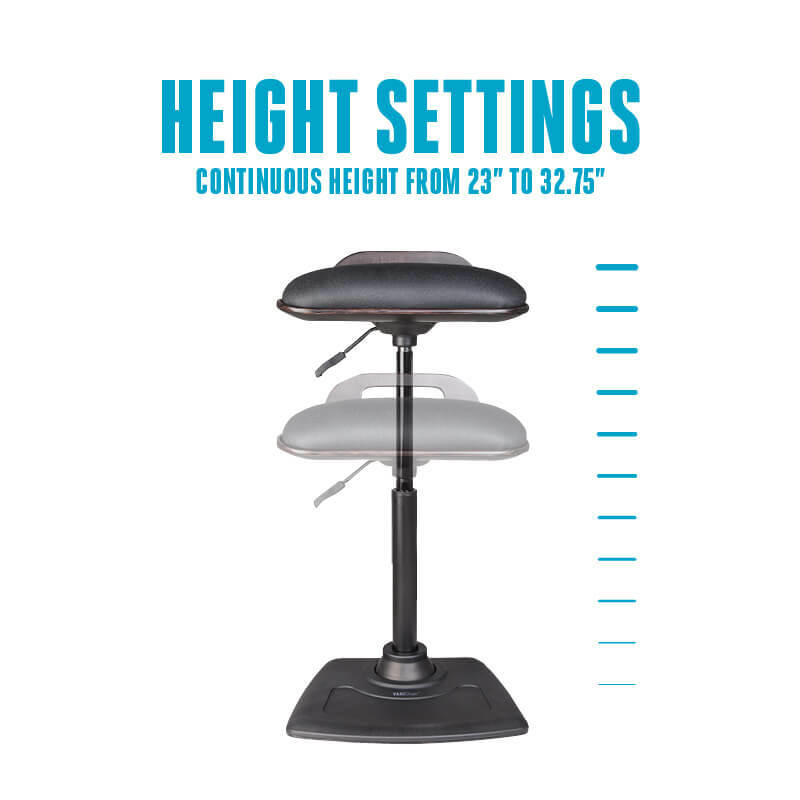 Varier Move Stool Review – Is It Still Reliable?